On our Log-In page, click on the message "Forgot your password?" You will be prompted to enter your e-mail address. Once you enter your e-mail address you will receive an e-mail with a link to reset your password. If you have further issues, call us at 830.964.6133. Where are the product sizes listed? All of our products have exact sizes listed. 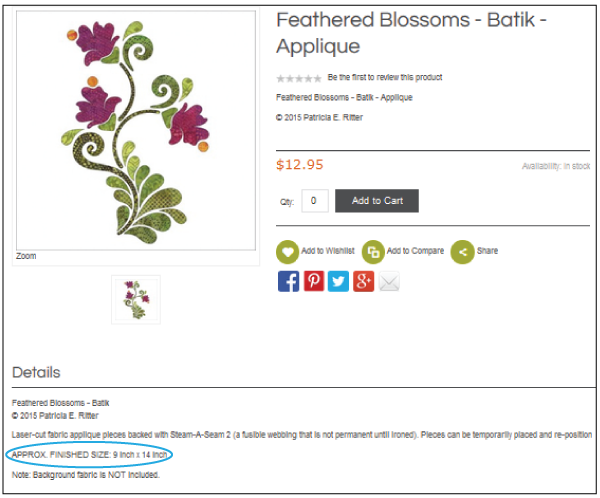 Once you've clicked on a product, just scroll down further on the page until tyou see the word DETAILS. Underneath that you'll see the specifics of the desing. NOTE: It's directly above REVIEWS. I need assistance checking out. Alway feel free to call us at 830.964.6133 to help you place an order, or e-mail us at onlinestore@urbanelementz.com. How do I access my downloadable purchases? Your downloadable purchases are always available through your Urban Elementz and Applique Elementz accounts. 2. On your account page is a link for "My Downloadable Products"
My Downloadable Products page where you can access all of your digital purchases. 2. To download your digital file from your My Downloadable Products page, click on the design name that is in orange. 3. A window will pop up asking you if you would like to OPEN, SAVE, or CANCEL. Always click “SAVE”. 4. Another window will open that shows locations on your computer. This is where you can choose the location that you want the file(s) to be saved on your computer. With some internet programs you can pick anywhere that you’d like the files to be saved, but please pick a location where you can find them again. NOTE: You will want to probably pick a location like “my documents” or a folder that you’ve created for downloads, patterns or something like that. 5. If you do not see a window asking where you'd like to save the file, it is most likely that your file was automatically downloaded to your computer's Downloads folder. If this is the case, please make note of where this ‘download” file is located. 5. Allow the download to complete. Check the location that you chose for the file to be saved to make sure that it is there. 6. You will now need to unzip the folder in order to access the actual pattern file to be read by your quilting machine system. What is your copyright information? You are purchasing a non-exclusive, revocable, non-transferable personal license to reproduce the pattern(s) included in your purchase (“Licensed Patterns”). copyright(s) protecting the Licensed Patterns and breach of this license granted herein. to any other person without written permission from Urban Elementz. contact Urban Elementz to obtain permission. an excuse for you not including the proper copyright notice and the name of the author or authors who created the Licensed Pattern(s) in any Finished Goods you create. and without providing the name of the individual or individuals who authored the Licensed Pattern(s). Is it secure to place an order through your site? You can place your order online with complete confidence in the safety of your personal and credit card information. This information is only used to process your order. We will never sell, trade or distribute your personal information without your prior consent. All orders are shipped Monday/Wednesday/Friday via the United States Post Office or via Federal Express ground. Orders are packaged and shipped as quickly as possible. We make every effort to ship items within one to three days (but unfortunately this is not always possible). The United States Postal Service & FedEx both estimate that packages ship within 3-5 business-days, although this is not guaranteed. If you are a Texas resident, Texas state sales tax (8.25%) will be added when we process your order. or replace any item that does not meet your expectations. All items must be returned in their original condition within 14 days. All Design Board sales are FINAL. Digital and custom-size purchases are non-refundable. Yes, we do! To purchase a gift card, please enter the “Gift Card” button into the home screen's Search bar, or click here. 1. Continue to place the order online, adding a note to the order (at checkout) requesting a paper certificate and where to mail it to. If you do not want the recipient to receive e-mail notification of the certificate, please use your own e-mail for the Recipient's E-mail portion. 2. Call our offices at 830.964.6133 to place a phone order for the gift certificate. money orders however; we will not ship until we receive payment. user ID and password will be assigned to access wholesale pricing online. specifically requested, we do not hold shipments for out of stock items either. website. Catalogs will be updated upon the next revision. longarm classes, we have a discounted Rental Pack available for use by multiple people. Please call 830-964-6133 for additional information on our Rental Pack. What is the Applique Block of the Month Club? / How do I join? / How do I unsubscribe/suspend my membership? You’ve heard of the Book of the Month and the Fruit of the Month clubs, right? Well, we have the Applique Block of the Month Club! Here's the deal ... we send you the laser-cut fusible applique pieces for a 12" finished block every month and at the end of the year you'll have all the applique you need for an amazing quilt. 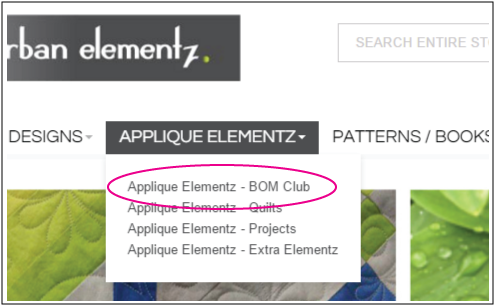 You can join our club though the Applique Elementz - BOM via the navigation bar's APPLIQUE menu. We always preview that month's club at the start of the month.... If there is ever a design that doesn't tickle your fancy, or if you are looking to cancel your subscription, it's easy to opt out for a month or two or unsubscribe all-together. Just log into your Urban Elementz account, click the Account button on the home page, and suspend/unsuspend/cancel under the Subscription section. You can even change your credit card information from here. 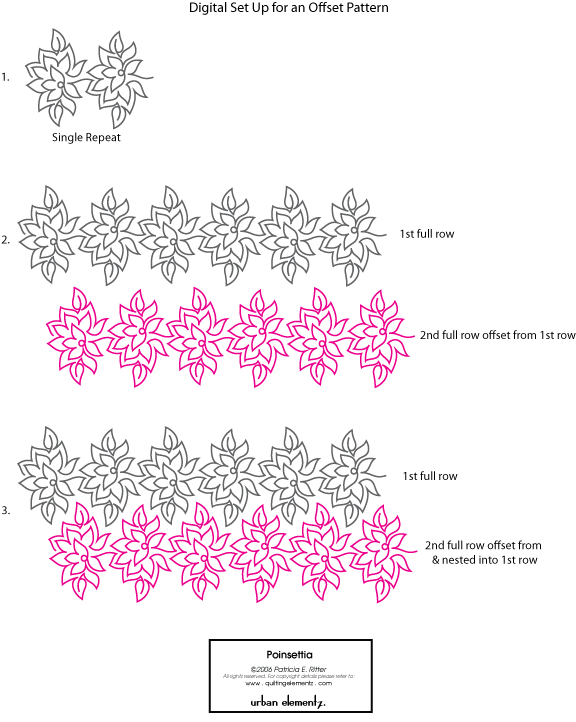 What are the best techniques for fusing Applique Elementz? to be sure fusible web has adhered properly. NOTE: After removing the paper backing the wrong side of the fabric should feel slightly sticky. instructions above. Let the appliqué pieces cool and try partially peeling the paper backing from one of the applique pieces again. If the fusible web has adhered properly, proceed using appliqué accordingly. 1. 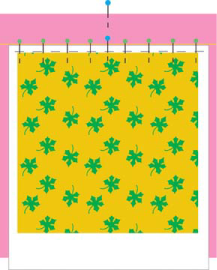 Layout your background fabric, tee shirt, tote or pillow. 2. Refer to the image of the applique on the packaging. We recommend starting with the biggest or central piece first. 4. Place the pre-cut shapes in the desired position & re-position if necessary. 5. Press the shapes in place with your hand. Now your pieces will be temporarily held in place until the final pressing. 5. Once satisfied with your placement, press the shapes with an iron (10-15 seconds) until fused and the design will be permanently bonded to your project. How do I prepare a Quilt Sandwich? 1. Mark a straight line approximately 2” across your backing fabric from side to side on the wrong side of the fabric. Then mark the center of your backing fabric. 2. Lay your quilt backing wrong side up across a table or the bars of your frame with the marked line facing towards you. 3. 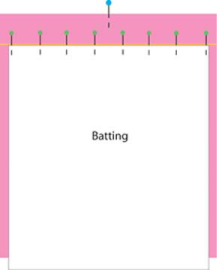 Lay out your batting across the backing, aligning the top of the batting with the 2” line on the backing fabric. Let the remainder of the batting hang down. 4. Beginning at the center, pin your batting to the backing. Using your regular sewing machine baste the batting and backing together, making sure to keep the edge of the machine’s foot with the edge of the batting. 5. Now mark the center of your quilt top. Lay your quilt top across the backing/batting sandwich. Beginning at the center mark pin your quilt top to the batting/backing sandwich, matching its top edge of your quilt top along the stitched line you created in step #4. 6. On your regular sewing machine baste stitch your quilt top to the backing/batting sandwich. 7. Take the entire "sandwich" to your quilting frame. Lay the completed sandwich across the bars of your machine and attach the top edge of your sandwich to the take-up roller. Remember to start at the center and work out in both directions. 8. Throw the quilt top and batting over the take-up roller out of the way. 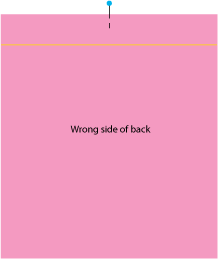 Line up the other edge of your backing with the back roller of your frame. Again starting at the center and working out in both directions attach the backing to the back roller. 9. Roll your backing fabric taut onto the back roller. Straighten and remove any wrinkles in the backing fabric so it is completely flat. Now flip batting and quilt top back into place. Straighten and remove any wrinkles in the batting and the quilt top so it is completely flat and square. 10. Now you can begin your quilting. 11. When you reach the bottom of your quilt, spray a little 505 spray on the wrong side of you quilt top to hold the edge down,and baste the bottom of your sandwich together, again beginning at the center and moving out in each direction. How do I line up the next row using a pantograph? After sewing the two full rows of the design ( or the single full row ) place your laser light on an identifiable point on the partial row that is closest to the take-up bar. Drop your needle into the down position. This is done before you advance the quilt. Then carefully roll up your quilt ( leaving your needle in the down position ) until your laser light is lined up with the same identifiable point but on the full row that is closest to you. Or in other words, until you get to the same identifiable point on the design in the first row that you sewed. 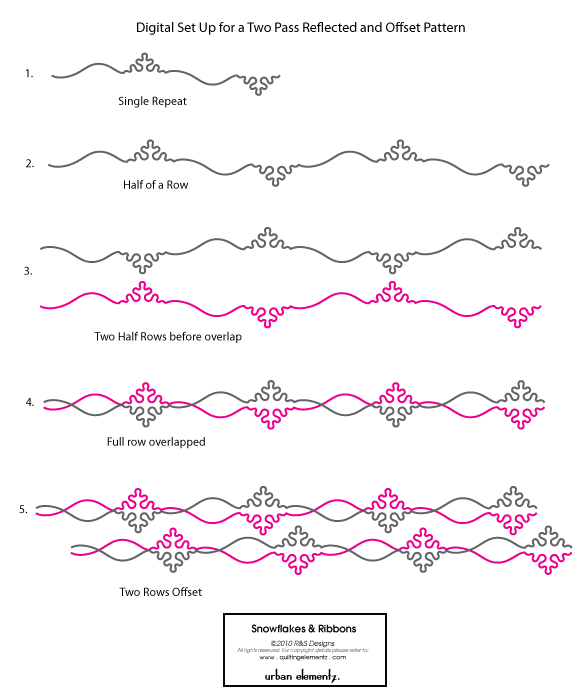 Now you can begin sewing the first row of you design again. Many of our patterns are inset patterns. Inset patterns create beautiful, interlocked and all-over quilting designs. 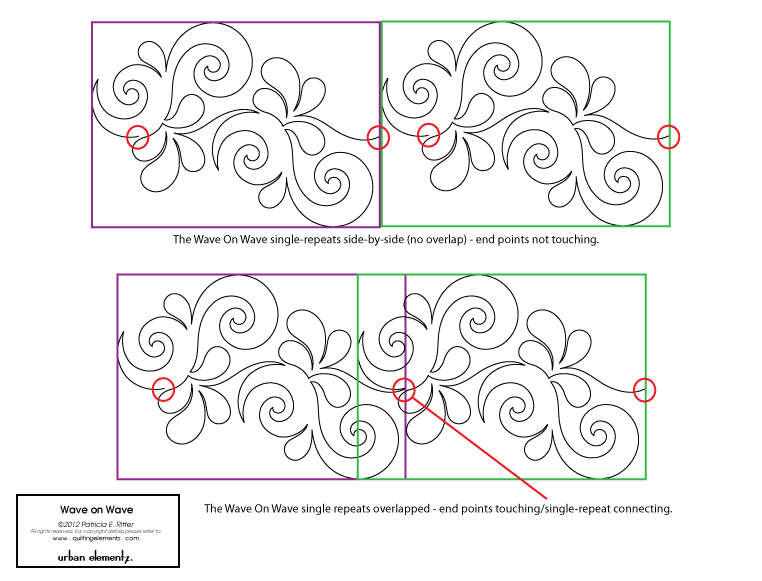 Inset designs require that you overlap the single-repeats of your design until the edges connect. 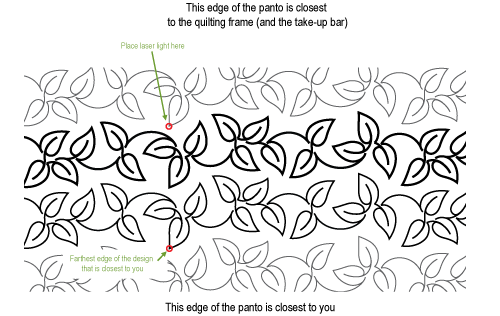 ***For additional information on how to make your designs overlap from edge-to-edge, please refer to your personal computerized quilting system's manual - this function differs from system to system. With these designs, it is necessary to MANUALLY set up the digital file to offset each alternating row. With these designs, the same row will be stitched twice. It will be necessary to MANUALLY set up the digital file to be a reflected offset two pass pattern.